".....We were very impressed that Brownie was able to get all 2400 people through the buffet including dessert in one & half hours while still maintaining a high standard of food and presentation. Our customers the Vintage Car Club of New Zealand were very pleased with the meal and service they received from Brownie's Spit Spectacular. The Mystery Creek Events Centre has no problem recommending Brownie's Spit Spectacular for all events big and small. ".....Your efforts on our special day were absolutely fantastic. The meal was superb and the service from you and your wife could not be faulted. You fitted in like old friends!..." Thanks again Brownie - you really made our evening! 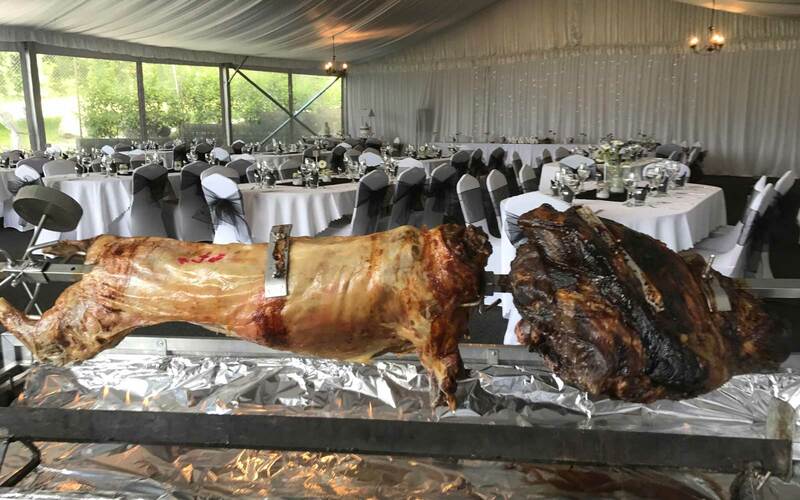 We are the only Authentic spit roast in the Bay & Waikato, please click our video to see what no one else can give you!! We are the most experienced & longest established Spit roast co in the Bay and Waikato, 22 years!! We cater for the real kiwi appetite, and are famous for our generous portions..you eat until you’re not hungry! And the last person gets the same as the first person!! We also offer comprehensive menus for breakfast, lunch and dinner. Seafood, Vegetarian, Meat or combination cuisine. Your choice from Soup, a selection of Finger Foods, Entrees, and Meats plus Vegetables and Salads, Desserts. Our group of 140 people has used you for the last two years to serve us a meal extravaganza at our annual get together. Your service has been outstanding and the food has been of the highest quality with "seconds" available for anyone and everyone who could fit it in. We have no hesitation to recommend Brownie and his team for any occasion. In fact we have booked Brownie again for October 2017. On behalf of the Katikati College 50th School Reunion Committee, I would like to give you a big thanks for the wonderful job you and your staff did for our Saturday night Reunion dinner .Catering for 400 guests We have nothing but praise for the food and the way you all integrated. You were a big part of our event. Working with you over the planning period and the night has been stress free. Thank you Brownie, you are wonderful. ".....months after our wedding our guests are still going on about one thing - your food - not how gorgeous I looked, how exquisite the cake was, nor how lovely the flowers were - your food!!!!" ".....We were very impressed that Brownie was able to get all 2400 people through the buffet including dessert in 1 1/2 hours while still maintaining a high standard of food and presentation. Our customers the Vintage Car Club of New Zealand were very pleased with the meal and service they received from Brownie's Spit Spectacular. The Mystery Creek Events Centre has no problem recommending Brownie's Spit Spectacular for all events big and small.